The Colorado Rockies head to Marlins Park on Saturday, August 12, 2017 to take on the Miami Marlins. The expected starting pitchers are Jeff Hoffman for the Rockies and Justin Nicolino for the Marlins. The odds for this matchup have Colorado at -155 and Miami at +145. The Rockies have a 48-60-6 over/under mark and a 60-54-0 run line record. The Marlins are 61-52-0 against the run line and have a 58-48-7 over/under record. The Rockies have a 65-49 overall record this season. Starting pitcher Jeff Hoffman has a 6-3 record with an earned run average of 5.03 and a WHIP of 1.32. He has 71 strikeouts over his 82.1 innings pitched and he's given up 81 hits. He allows 8.9 hits per 9 innings and he has a FIP of 4. The bullpen has an earned run average of 4.54 and they have given up 379 base hits on the year. Teams are hitting .256 against the bullpen and they've struck out 381 hitters and walked 151 batters. As a team, Colorado allows 9 hits per nine innings while striking out 8 batters per nine innings. They are 22nd in the league in team earned run average at 4.64. The Rockies pitchers collectively have given up 1,022 base hits and 524 earned runs. They have allowed 140 home runs this season, ranking them 17th in the league. Colorado as a pitching staff has walked 392 batters and struck out 900. They have walked 3.5 men per 9 innings while striking out 8 per 9. They have a team WHIP of 1.39 and their FIP as a unit is 4.43. As a team Colorado is hitting .274, good for 3rd in the league. The Rockies hold a .442 team slugging percentage and an on-base percentage of .333, which is good for 8th in baseball. They rank 3rd in MLB with 9.4 hits per game. Nolan Arenado is hitting .315 with an on-base percentage of .363. He has 140 hits this season in 444 at bats with 98 runs batted in. He has a slugging percentage of .588 and an OPS+ of 129. Charlie Blackmon is hitting .333 this year and he has an on-base percentage of .388. He has totaled 154 hits and he has driven in 74 men in 463 at bats. His OPS+ is 142 while his slugging percentage is at .616. The Rockies have 1,074 hits, including 205 doubles and 134 home runs. Colorado has walked 330 times so far this season and they have struck out 1,007 times as a unit. They have left 730 men on base and have a team OPS of .775. They score 5.24 runs per contest and have scored a total of 597 runs this year. Miami has a 53-60 overall mark this year. With an earned run average of 5.31, Justin Nicolino has a 0-1 record and a 1.82 WHIP. He has 14 strikeouts over the 20.1 innings he's pitched. He's also given up 29 hits. He allows 12.8 hits per nine innings and his FIP stands at 6.28. The bullpen has an earned run average of 4.26 and they have given up 402 base hits on the year. Teams are hitting .250 against the Marlins bullpen. Their relievers have struck out 381 batters and walked 188 opposing hitters. As a team, Miami allows 8.7 hits per nine innings while striking out 7.6 batters per nine innings. They are 20th in the league in team earned run average at 4.62. The Marlins pitchers as a team have surrendered 963 base knocks and 513 earned runs this season. They have given up 123 home runs this year, which ranks 27th in Major League Baseball. Miami as a staff has walked 430 hitters and struck out 849 batters. They give up a walk 3.9 times per 9 innings while they strike out 7.6 per 9. Their team WHIP is 1.39 while their FIP as a staff is 4.49. As a team, they are batting .263, good for 5th in the league. The Marlins hold a .426 team slugging percentage and an on-base percentage of .325, which is good for 15th in baseball. They rank 6th in MLB with 9.0 hits per contest. Giancarlo Stanton comes into this matchup batting .275 with an OBP of .368. He has 114 hits this year along with 85 RBI in 415 AB's. He maintains a slugging percentage of .614 with an OPS+ of 157. Marcell Ozuna is hitting .303 this season and he has an OBP of .359. He has collected 131 hits in 433 at bats while driving in 87 runs. He has an OPS+ of 138 and a slugging percentage of .545. The Marlins as a unit have 1,021 base hits, including 190 doubles and 137 homers. Miami has walked 322 times this year and they have struck out on 883 occasions. They have had 767 men left on base and have an OPS of .752. They have scored 4.65 runs per game and totaled 526 runs this season. 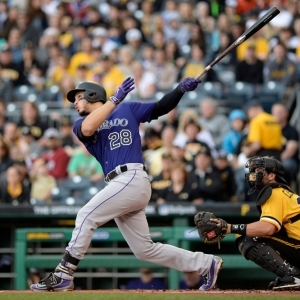 Who will win tonight's Rockies/Marlins MLB game against the spread?